Often called the Crown Jewel of New Orleans, the French Quarter is one of NOLA's most historic neighborhoods, but you'll find plenty of new mixed in with the old. There’s a reimagined French Market, modern boutiques and artisan cocktails mixed with beloved antique stores and old restaurants. For many New Orleans visitors, Bourbon Street embodies the life of a party town. The street is lit by neon lights, throbbing with music and decorated by beads and balconies. Named for a royal family in France and not the amber-colored alcohol, Bourbon Street has become a place for revelry of all sorts. 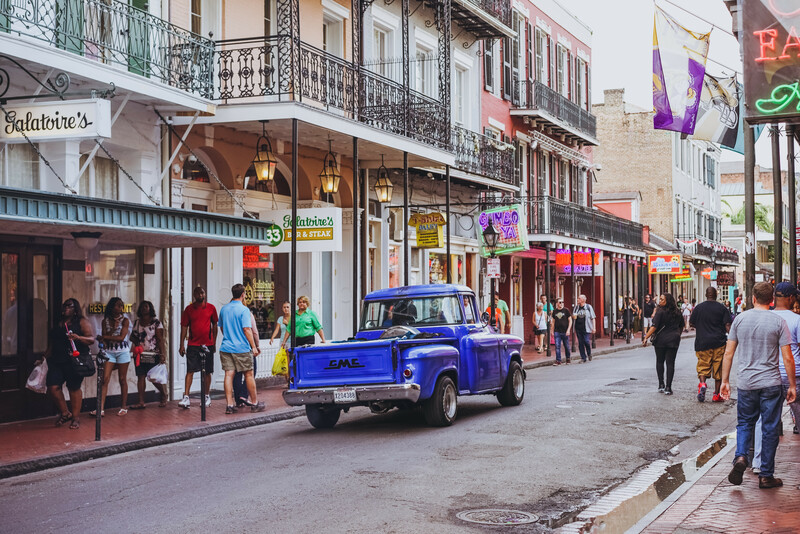 Royal Street is a repository of family-owned antique shops and fine art galleries just a block and yet a world away from the party on Bourbon Street. Frenchmen Street might just be the most musical stretch of asphalt in New Orleans. Its venues offer an array of live performances ranging from traditional jazz to blues to reggae and rock and attract audiences from all over the world. 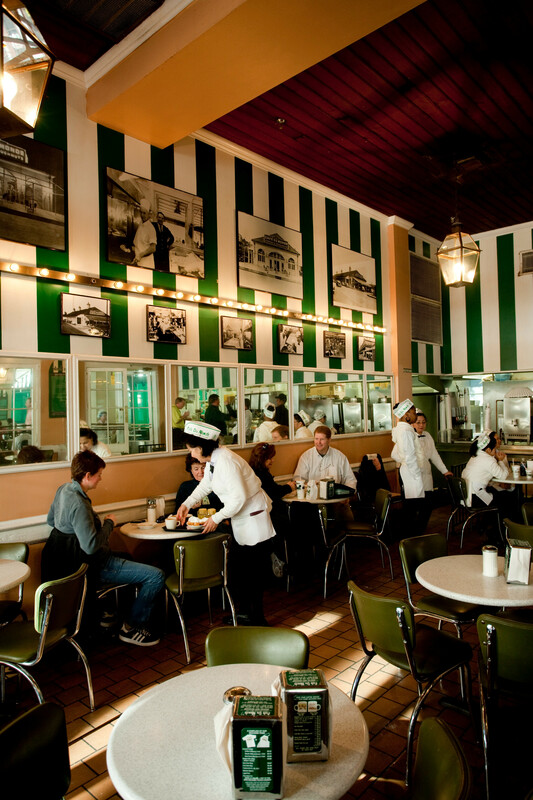 Open since 1862, Café du Monde is the Original French Market coffee stand. Grab a café au lait (coffee with chicory and hot milk) and beignet and enjoy breakfast while people watching on Jackson Square. Open 24 hours a day. Located on Decatur Street, Jackson Square earns it name for one of three bronze statues of Andrew Jackson located in the center of the square. The area surrounding Jackson Square contains a mix of commercial and residential property. The lower floors of the buildings are shops and restaurants, while the second and third floors are residential apartments. Jackson Square is also the location of an open-air artist colony, where artists display their work on the outside of the iron fence. Visitors even have the opportunity to see the artists at work and perhaps have their portrait drawn by one of the many talents utilizing the square as their studio. 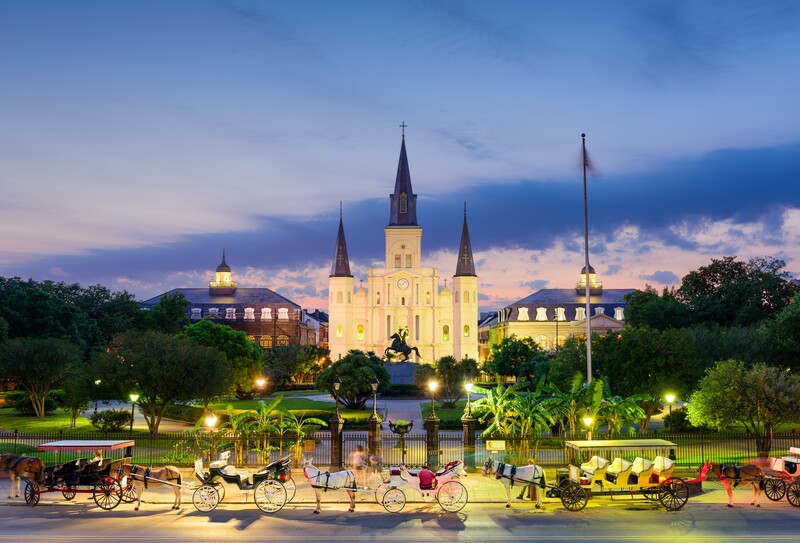 Facing Jackson Square and flanked by the historic Cabildo on one side and the equally historic Presbytere on the other, St. Louis Cathedral is among the tallest and most imposing structures in the French Quarter. And one of the most recognizable. It has been seen in hundreds of movies, TV shows and it is a local and international architectural icon. As the mother church of the Archdiocese of New Orleans, St. Louis Cathedral has a long and interesting history. It is the oldest continuously active Roman Catholic Cathedral in the United States, originally built in 1727 and dedicated to King Louis IX of France, "The Crusading King" who was later canonized by the Church. In September 1987 the cathedral witnessed the historic visit of Pope John Paul II. Since its opening day on D-Day - June 6, 2000 - nearly two million visitors have toured the National WWII Museum. A must-see for history lovers, it has been designated by the U.S. Congress as America’s official WWII Museum. Powerful images and extraordinary artifacts bring to life the American Spirit, the courage, teamwork and sacrifice of the young men and women who won the war and changed the world. 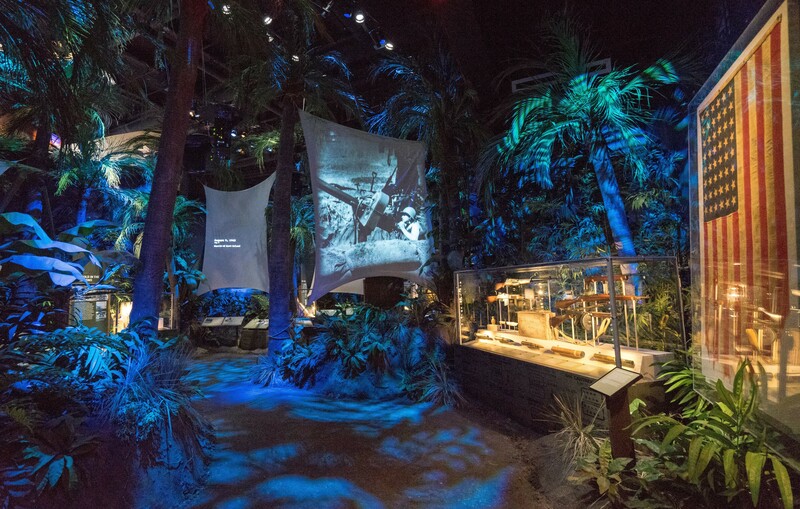 From the 1930s prelude to war, to the Normandy Invasion and the battles of the Pacific Islands, visitors trace America's role in the war and on the Home Front. Burying the dead in a place built below sea level was a problem that faced the earliest residents of the French settlement that became New Orleans. The solution agreed upon, to entomb the departed in elaborate marble chambers above ground, created one of the city’s most lingering attractions: cemeteries that are both historic and hauntingly beautiful. Wander the purported resting places of voodoo queen Marie Laveau and musician Al Hirt, both residents of what is known in New Orleans as the Cities of the Dead. Many offer guided tours (St. Louis Cemetery No. 1 & Lafayette Cemetery No. 1), others you can explore on your own. Streetcars are a charming and convenient way to experience the many areas of New Orleans. Four distinct lines, each originating Downtown, will take you through the French Quarter and beyond to places you might not otherwise get to see. 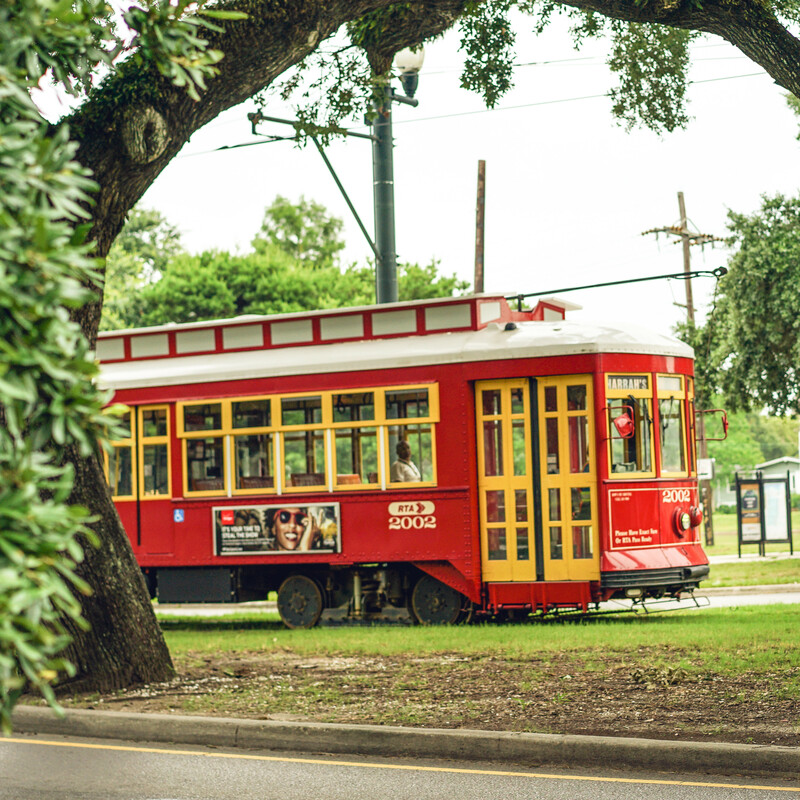 Swaying along St. Charles Avenue through a tunnel of Live Oaks, the dark green streetcar passes dozens of antebellum mansions, Loyola and Tulane universities, breathtaking Audubon Park, and fine hotels, restaurants and bars. The red Canal Streetcar Line takes locals and tourists to work and play each day on a 5.5-mile route from the foot of Canal Street through the Central Business District and into the Mid-City area. The Garden District is known for its variety of historic homes, from colorful row houses to Classic Revival mansions and charming cottages shadowed by giant oak trees. These beautiful homes and gardens line many blocks of this neighborhood, making it most famous for its stunning architecture. 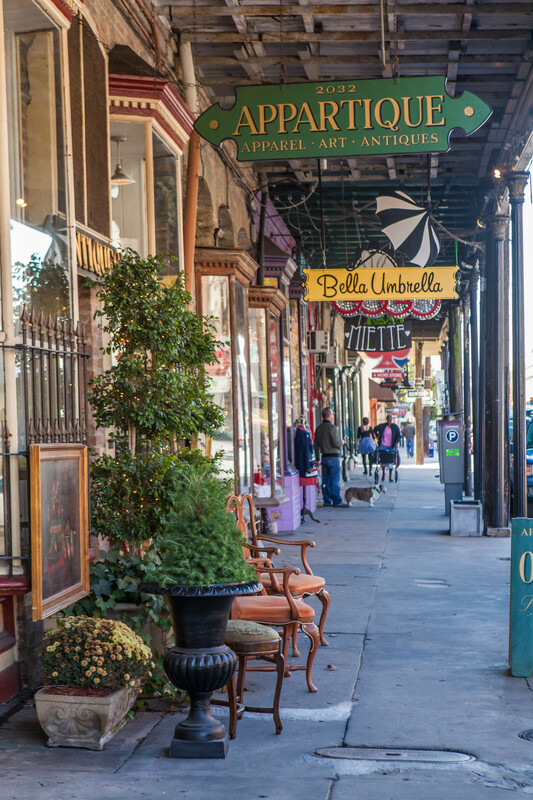 Take a walking tour or a bus tour through the famous streets of the Garden District and Uptown New Orleans. The air’s opulent with the scent of jasmine and blossoming ancient magnolia. Stretching six miles parallel to the Mississippi River from Canal Street to Audubon Park, Magazine Street travels from the Central Business District and the Warehouse Arts District through the Garden District and Uptown. Originally named for a warehouse that Spanish Governor Miro built to house Kentucky tobacco and other exports, this retail street’s stores offer a delightful antidote to the typical mall experience. Clusters of shops are interspersed with charming homes, and a mix of renovated warehouses and shops selling housewares, pottery, period furniture, clothing, books and jewelry. Magazine Street is the ideal spot for a leisurely walk, with plenty of coffee shops, cafes and restaurants to provide a pit stop and refreshment to the tired shopper.